Although we were both along the Platte River looking for birds I was looking to photograph them while this guy was looking for a meal. Perhaps a Thanksgiving goose and the duck just off the bank seems well aware of this. The leaf implies the seed. Nice shot, Mike. I love these guys. I love hearing them at night, and watching them catch mice in our field. Hi, must be fun having them so close that you can watch them on a regular basis and I also love when I can hear them in the evening. Thanks Sreejith, the weekend was good and so far the week is going well. Gorgeous portrait, Mike. Hope the goose wasn’t cooked…. Hi Jane, not sure he got a goose this day or was just shopping for thanksgiving. Looks like a healthy specimen. Great capture. One crossed the road in front of the car around sunset as we were driving home. This is their best time of year. It gets tougher once the snows come. He was indeed a healthy hunter as there is plenty to eat along the river. He has numerous of places to warm up during the winter here in the city. A good coyote shot makes for a good day! Indeed. Thanks Lyle and hope your day is a fine one. 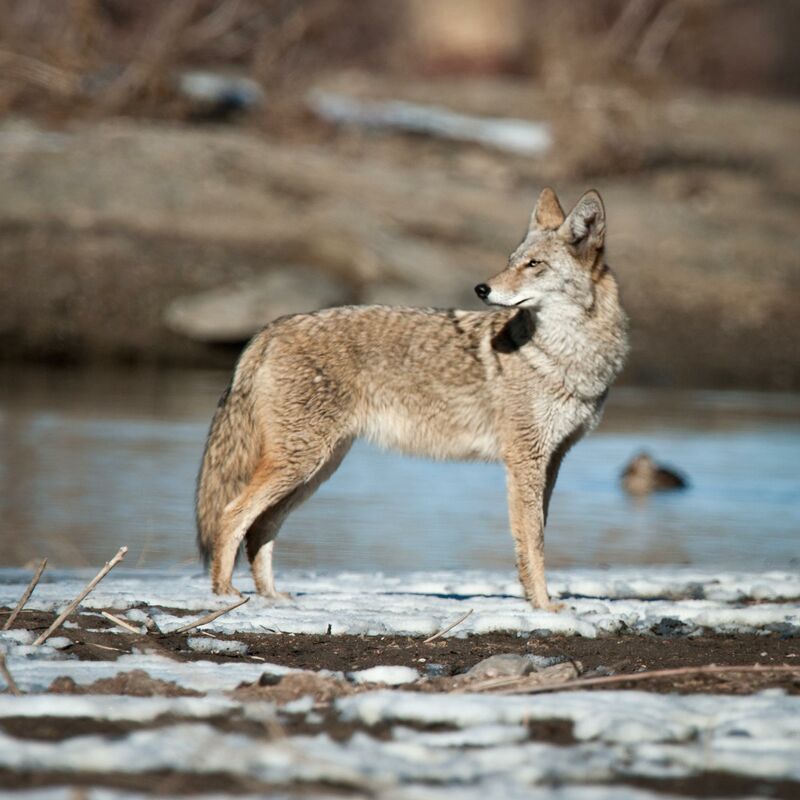 We have a lot of coyotes in my neighborhood in Ridgway, CO (so I am told). They are very elusive so I really respect your super capture here! What lens did you use? I have only been able to see them from a far off distance. Hi Denise, I reckon since this guy lives close to people he is not a skid dish as your Coyotes. I think I used a 70-300mm zoom on tis one.